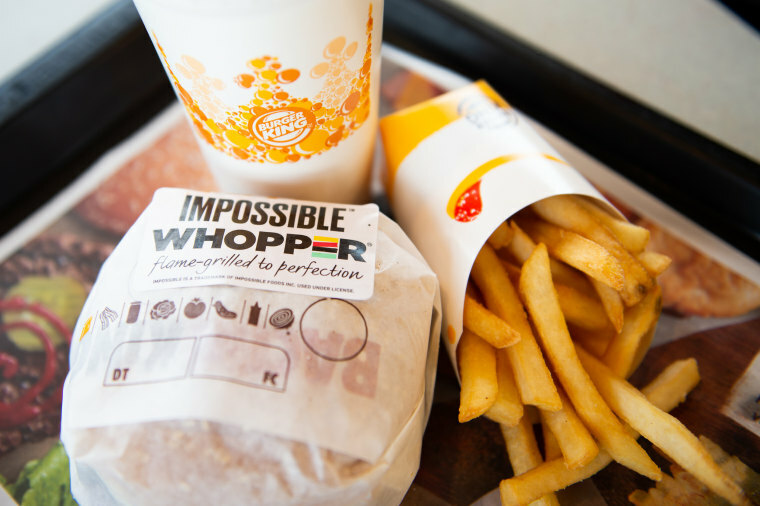 Burger King has a meatless 'Impossible' Whopper. Is it healthier than the original? What's in the meatless Impossible Whopper — and is it better for you? A registered dietitian weighs in. In a move that made some people cheer, Burger King announced that it's testing a meatless Whopper, which the company says will be just like the classic but without the beef. What has fans cheering is the fact that the Impossible Whopper is made with the Impossible Burger, which is designed to closely match the taste and texture of meat. I’m always willing to give props to fast food chains for finding tasty ways to help reduce meat consumption. I recently wrote about the health benefits of cutting back on animal foods. Still, it must be said, not all plant foods are created equal. A processed food is anything that takes a trip down the manufacturing process. In essence, canned chickpeas could be considered processed, although minimally so. Processing represents a spectrum, from minimally processed, such as the case with the canned beans, to heavily processed or ultra-processed. Often times, highly processed foods may have additives to enhance flavor or texture, preservatives to keep these foods safe to eat for prolonged periods of time, or even vitamins and minerals added to replace those that might have trickled out during the manufacturing process. This may seem beneficial, but the truth is, there is indisputable evidence that bodies thrive when eating more whole foods and fewer processed ones. Benefits like a sharper memory with the ability to concentrate through complex tasks, healthy body sizes and waist measurements, and a lower risk of chronic diseases have all been tied to an eating pattern that’s low in processed foods, and high in whole, nourishing ones. Where does the Impossible Whopper fit in? An Impossible Burger is a soy-based patty. Examples of whole forms of soy include tofu, edamame and soy milk. These are minimally processed and can provide a spectrum of nutrients naturally found in plants. The Impossible Burger, on the other hand, is largely made of soy protein concentrate, along with ingredients, like potato protein, methylcellulose, yeast extract, cultured dextrose, food starch modified, and soy leghemoglobin, plus what essentially amounts to a multivitamin’s worth of additional vitamins and minerals. That makes it a convenient way to pump up your protein, especially at a fast food joint where meatless options may be hard to come by, but that doesn’t mean it provides the same benefits as whole foods. According to Wendy Chen, MD, MPH, senior physician at Susan F. Smith Center for Women’s Cancers at Dana-Farber, while we know whole forms of soy foods are totally safe, we just don’t have enough information to say whether processed forms are OK in the long-run. “The long-term effects of consumption of soy protein concentrates and isolates in humans is unknown,” she says. While this may sound alarm bells, don’t panic. Chen says that none of the ingredients found in the Impossible Burger are known to be toxic so modest consumption shouldn’t be harmful. How do the Whoppers compare? Let’s say you’re eating this plant-based burger because it sounds somewhat healthier than the traditional Whopper. Based on Burger King’s data, I don’t think you’re trading up with the Impossible Whopper — but you aren’t really hitting it out of the park with either burger. What makes a healthy fast food meal? Protein from real food sources. Most of the time, look for protein from whole foods, like chickpeas or black beans, tofu or edamame, or eggs if you eat them. Sometimes, convenience rules, and that’s when a meal, like the Impossible Whopper might fit in. Veggie-centric. Generally, you’re looking for more veggies than the layer of tomatoes, onions and lettuce on a Whopper. How many veggies? A cup is a good starting point; two is better. These are the foods that supply the raw materials your body needs to thrive. Higher in healthy fats. Most health authorities suggest limiting saturated fat intake to no more than 22 grams per day; the American Heart Association suggests aiming for only 13 grams per day (based on a 2,000 calorie diet). It doesn’t take a math whiz to see that both Whoppers are high in saturated fat, nearly reaching the AHA’s upper limit. Healthful fats are found in plant foods, like avocado, nuts and seeds (and their butters), olives and olive oil. You won’t find them on a fast food menu, but salmon and other fatty fish are also full of healthful fats. Predominantly or totally whole grain. Unfortunately, whole grain buns are not the norm in fast food joints, but there are some chains that serve sandwiches on whole-wheat bread. You can also find meals made with brown rice, another healthy whole grain. Oatmeal is a wonderful whole grain, but sometimes the added sugars in fast food oatmeal offset the healthfulness of the dish. Low in added sugars. Granted, this doesn’t usually apply to burgers, but it does apply to many of the condiments, like ketchup and relish. Bread may be another sneaky source of added sugar. And of course, many fast food meals are value-priced with a sugary soft drink. That may seem like good bang for the buck, but it doesn’t have a strong ROI. A better idea is to skip the value meal and have water instead. And be sensible with condiments — not too much, not too little. You’ll notice there’s no sodium target in the guidelines above. That’s because fast food meals are notoriously high in sodium with many dishes (including the Impossible Whopper) supplying about a half a day’s worth. Since the sodium levels are over-the-top at fast food chains, your best bet is to be mindful of other sources of sodium on days when you dine on fast food. At the same time, eat more fruits and veggies. These foods supply the mineral, potassium, which helps flush the sodium out of your system. Drinking more water will also help. Finally, any healthy diet includes a diverse range of whole plant foods, such as vegetables, fruits, beans, nuts, seeds and whole grains. Though an occasional fast food meal is fine, Chen says it’s better to eat food that’s cooked from scratch — whether that’s at home or at a restaurant — rather than food that’s been highly processed.